The Geowiz ELD LTE is everything a single truck owner/operator needs to be ELD compliant for $299 one-time payment. Includes ELD Hardware and APP. 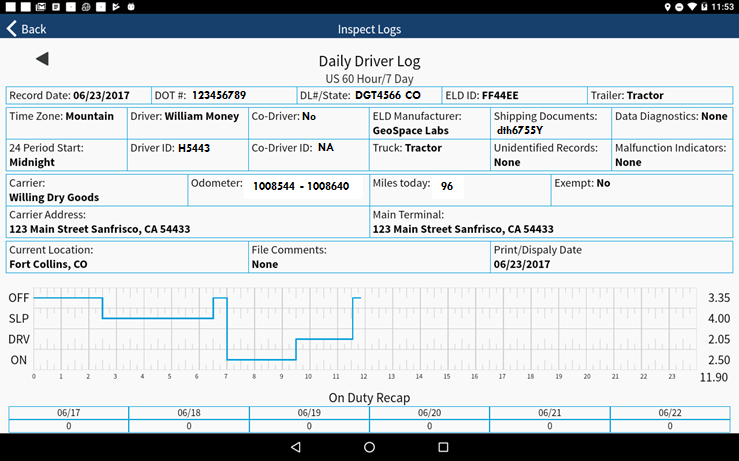 The Geowiz ELD provides drivers with clear application of the complex FMCSA Hours of Service Part 395, Driver Vehicle Inspection Reports Part 396(11), and other key electronic logging requirements to meet the 49 CFR Parts 385, 386, 390, and 395 Final Rule that goes into effect December 2017. This includes connecting to the vehicle engine and recording engine events alongside GPS data and hours of service rules. Other than going on and off duty, the system is completely automated and little interaction is required. Drivers can elect to put themselves in YARD mode or PERSONAL CONVEYANCE as allowed by regulation. The system is generally oriented to property carrying drivers, however it does include provisions for passenger carrying drivers including the 10-hour limit, 15-hour limit, 60/70-hour limit, and sleeper berth provision. For property carrying drivers it includes the 11-hour limit, 14-hour limit, rest breaks, 60/70-hour limits, and the sleeper berth provision. The system has been built to emulate the paper process, the main ELD page even is modeled to look like the current required paper log (as much as is possible given regulatory requirements). The system does not require a data plan which will save you hundreds of dollars a year, and does not require that devices be ruggedized saving you even more. At roadside inspection, the FMCSA does require the ability to send your logs to an inspector via email. We provide you instructions for how to do this using your smart phone in real time. Starting August 2017, you will be able to use the ELD tablet additionally as a dashcam, and have recorded video available to saving should you need it, and fully integrated into your hours of service data, which will reduce your risk and could potentially save your career. We are adding this to the ELD to put some of the monitoring technology back on your side concerning this mandate, you know what we mean. If you install the system prior to December 2017, including successfully connecting to your engine so we can verify the installation date, you can run in AOBRD mode for up to two additional years, until December 2019. There are advantages and disadvantages to this option, but the choice is yours. 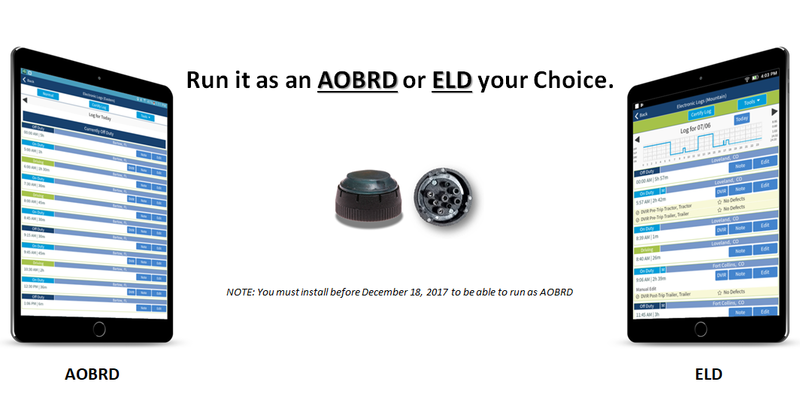 AOBRD have been prevalent in the industry since 1988, and they do many of the same things an ELD does, but there are some differences too. AOBRD are still synchronized with your engine and have safeguards to prevent what the FMCSA calls tampering. AOBRD record your location via GPS at each duty change, and identify if any of the system sensors have failed or are in error mode. 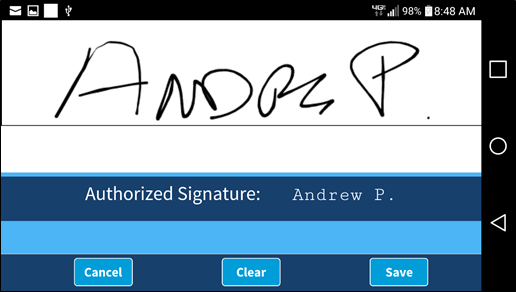 You MUST also print your signed logs and keep them in your home office in addition to the storage on the AOBRD system. AOBRD devices do not display the HOS graph and instead display a list with the sequence of duty changes. 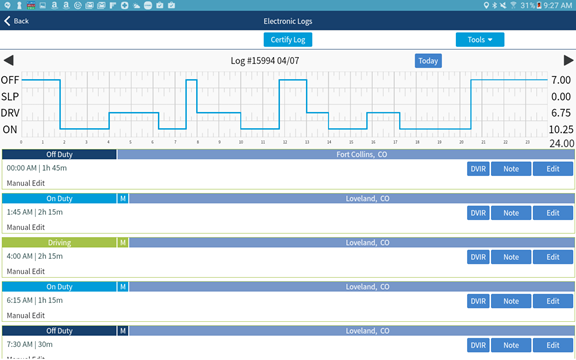 ELD’s are more restrictive than AOBRD’s so if you are used to paper logs, running in AOBRD mode until you are comfortable with electronic logs is a great transitional option. GeoSpace Labs does understand and we stive to offer as many transitional options to you as we can. We are nowhere near as impressed with ourselves as we are impressed by you at every interaction. Our mission is to help make people safer, every second of every day. Click on a question to see the answer for some of the frequently asked questions. Nope. You buy it and use it, just like the old days before everyone was trying to get their hand in your pocket for a monthly fee. Do I need a tablet or can I use my phone? You should think hard about running the ELD on your phone. If you do you will be handing your phone over to an inspector, which may be a police officer. Consider that they cannot *unsee* a text or email that comes through during the inspection. But you can use your phone if you want to, its up to you our APP does not care. However what is great about the Geowiz LTE ELD is that you can use a low-cost tablet as long as it has GPS capabilities. You do not need a data plan, unlike all other ELDs, which can save you hundreds of dollars a year! Nope not for the LTE version. 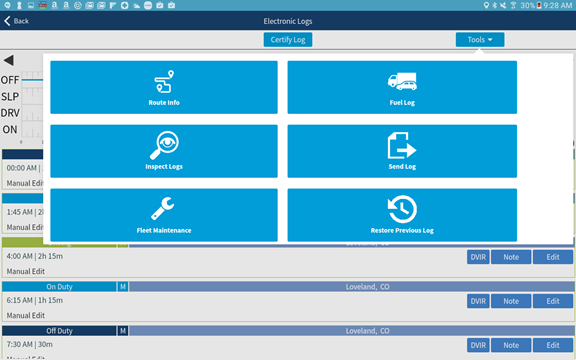 If you work for a company that wants to be able to use our PRO features (which are not required to be ELD compliant), then there is an option for them that includes a monthly fee, but that does not have anything to do with using the Geowiz LTE ELD as a FMCSA compliant logging device to meet the mandate. So the short answer is: Nope! No Monthly Fees! There are no wires and the ELD hardware itself is very small and can be installed in a few minutes. It is as easy as putting the small button device over the ECU port and loading an APP on your phone or tablet. Can I access my logs from the internet? Absolutely. You can use the same login and password you use for the ELD APP to access the Fierce website and see all of your logs. 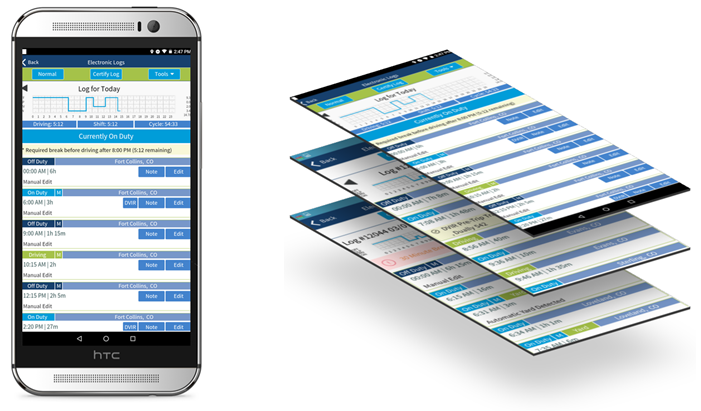 You can print them, run reports, and also access your IFTA miles reports. What happens during a roadside inspection? The system has an inspection mode that you put it in which provides the inspector all the required information. You place the display device into this mode and hand it to the officer. If they want to be emailed your logs we provide simple instructions for sending them in real-time at roadside. Is there a big learning curve? Maybe. We have made it as easy as it is going to be. The design emulates the current paper process as closely as the new regulations will let it, but, honestly, if you are not very good with your smart-phones now, yes, there will be a learning curve. If you are comfortable with smart-phones, using new APPs from the APP stores, then there will be less of a learning curve. We provide a lot of instructions as well as training videos to help with this. You can also contact our phone support with any setup questions. There may be a learning curve but Geowiz is as easy a transition as you will find out there. We provide excellent written instructions and instructional videos. You can also call our 800 number (877.443.6949) toll free and talk to a trained customer engagement representative. Yes, our certification number is #0008 and is registered as a compliant product on the FMCSA ELD website. We have an FMCSA business analyst we can ask questions of, and who asks questions of us to make sure our system meets the required standards. How can this be such a good deal? We know, all the other ELD providers seem to be charging an arm and a leg, they require you to have a data plan, and want monthly alimony payments from you. We think maybe they just see this as a chance to get rich, or take advantage of you because the government says you have to use one of these logging things. Also, as far as we can tell they have not thought the entire system all the way through, and they are asking you to pay for their lack of analysis. We believe in the old retail model, make a good product and sell it for a reasonable price. We will see which model wins out in the end. The system is very affordable, there are no monthly payments, and real-people answer the phone to provide support. Geowiz works in the US and Canada and provides IFTA summaries for all jurisdictions. Geowiz ELD has been designed from input from hundreds of drivers with millions of road miles. Real people answer the phone and are standing by to answer any questions. GeoSpace Labs is sympathetic to the impact ELDs will have and is working with you. Lowest Cost! No Hidden Fees! The below chart is a true story. The vendor names have been changed to protect the greedy. Everything else is told exactly as it will occur if you like to throw money out the window! Monthly Data Fee (3/4G) $0 Wow! $20Hidden Cost! $20Hidden Cost! $20Hidden Cost! $20Hidden Cost! Tablet Cost INCLUDED! Wow! $129Hidden Cost! $129Hidden Cost! $129Hidden Cost! $129Hidden Cost! Money Wasted After 2-Years NONE!Great! $1,070Bad! < $950Bad! $6,310What!?! $950Bad! Buy Geowiz ELD LTE Now! Sign up to get notified of system improvements and new features. Copyright 2017 GeoSpace Labs ALL RIGHTS RESERVED.